One fun way to basically reboot the thing is to place a prop/futures bet on the exact outcome. 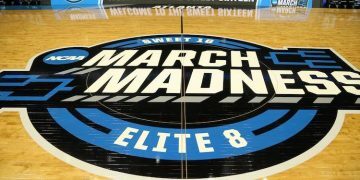 After one of the most exciting and competitive NCAA Tournament Elite Eight rounds ever, March Madness resumes on Saturday evening in Minneapolis when No. 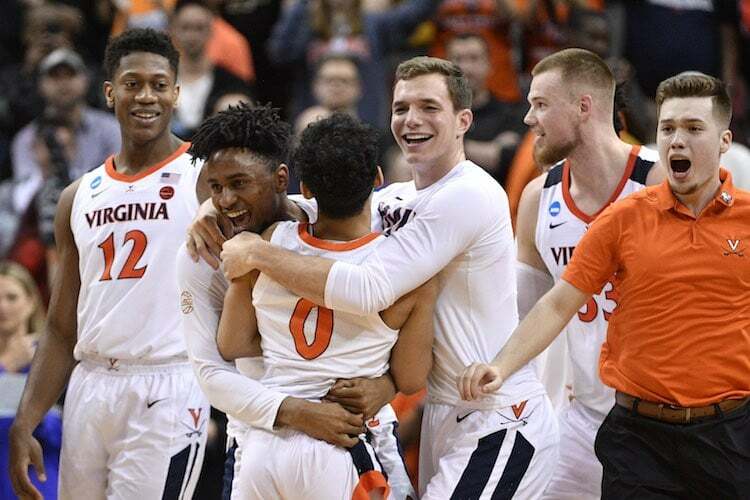 1 seed Virginia from the South Region battles No. 5 Auburn, representing the Midwest Region. In the second game, No. 2 Michigan State, which forced No. 1 Duke’s luck to expire in the East Region, will take on No. 3 Texas Tech from the West Region. 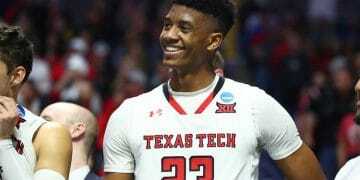 Both Texas Tech and Auburn’s basketball programs are making their first ever appearances in the Final Four. And both of those programs bring a couple fun/interesting coaches to the hardwood: The animated perspiration king Bruce Pearl for the Tigers, and Chris Beard for Tech, who just seven years ago was coaching the Myrtle Beach-based South Carolina Warriors, a semi-pro squad in the American Basketball Association. With three collegiate stops in between, most recently at Little Rock of the Sun Belt Conference, he’s two wins shy of a National Championship. In all likelihood your bracket was busted last week if not the week before that. Hopefully you took my advice here and avoided the prohibitive pre-tournament favorite Duke. Spreads and totals have settled here below at pretty much every sportsbook, with moneylines ticking up/down about 5 cents depending. These lines are so “tight” there’s really not much value to be had. My colleague Eric Raskin digs into that here. I think Auburn’s run ends on Saturday. Auburn survived Kentucky without 6’8” forward Chuma Okeke, who’s since had ACL surgery by the famed Dr. James Andrews after suffering a tear during the North Carolina game. I think the loss of their leading rebounder (also averages 12 points per game, and on the defensive end is their top shot blocker) is going to allow Virginia to hold the perimeter better and force Auburn to take even deeper or more obstructed threes which, admittedly, has been their forte. Michigan State is a 2.5-point favorite (-150/-160 moneyline depending) on the other side of the bracket as Texas Tech continues to surprise some people. But I think this game is about a coin flip and FiveThirtyEight metrics roughly support that notion, giving TTU a 46% chance to win. So I think with TTU at +135, a 42.6% implied probability, there’s some value there. Add it all up, that’s TTU-UVA in the National Championship. 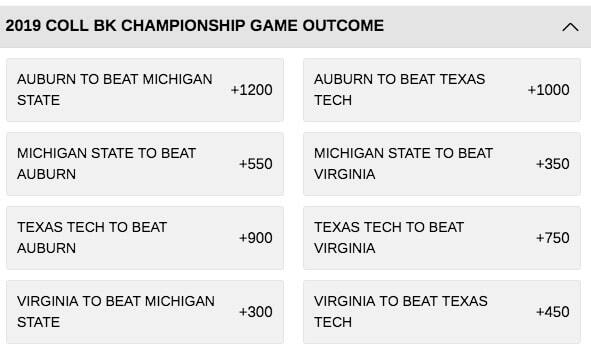 I’m rooting for the Red Raiders based on the 25-1 futures bet I placed pre-tournament, but Virginia rightfully will be the favorite. 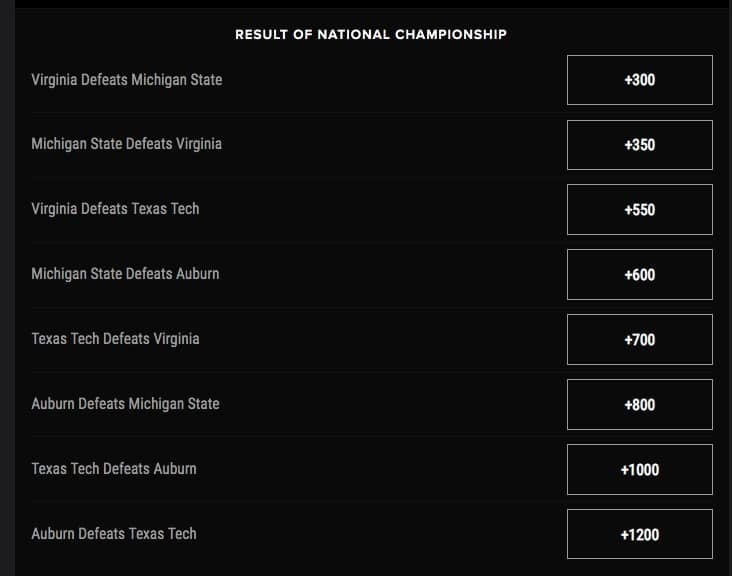 If you want to go that way, among NJ sportsbooks, PointsBet is your best bet with +550 odds on UVA > TTU. But as always, choose your own adventure. CBS Sports has analyses making the case for every team. 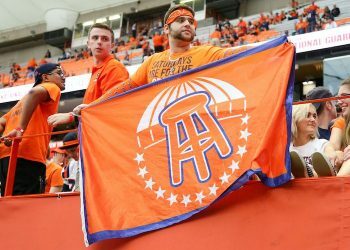 For amusement, above-average snark, perhaps some in-game betting opportunities, follow our Twitter list here. The list is curated weekly, pruning some patches that have grown wild in favor of more valuable plants. Get details on most of the members here. The PointsBet “Make It Rain” promotion — awarding $3 for every three-pointer your team hits on a minimum $100 spread bet — is still on through the end of the tournament. You can also get an exclusive $50 free bet along with rest of the other bonus package at PointsBet through Sports Handle.